There's been plenty of buzz around the South Australian craft beer scene in recent years – and with good reason too. Not only has the state experienced rapid growth in breweries as well as the arrival of some fine beer venues, but some of its breweries have gone on to garner national attention. One brewery that's been around longer than most, however, has rarely been part of that national conversation; you could argue it's not made that big a splash even within SA itself. But, as Goodieson approaches a decade of brewing in its McLaren Vale shed, you get the impression that's just how founders Jeff and Mary like it. Alexis Buxton-Collins dropped in for a chat. That’s because, for Goodieson's first three years, he was still working at Lion Nathan (now Lion). There, he looked after big sellers like Toohey’s and XXXX Gold as well as less enduring products like Hahn Witbier. He learnt the ins and outs of the beer business and, after working his way up to become head of new product development, spent five years working alongside Malt Shovel's brewmaster Chuck Hahn. Jeff describes that phase as “an amazing opportunity” and views his time at Lion as an “opportunity to learn and refine and understand the business as a whole and the supply chain.” But the end goal was always to open his own brewery, where tastebuds rather than test groups determined which beers he would release. And, when that time came, he knew McLaren Vale was where he wanted to be based. 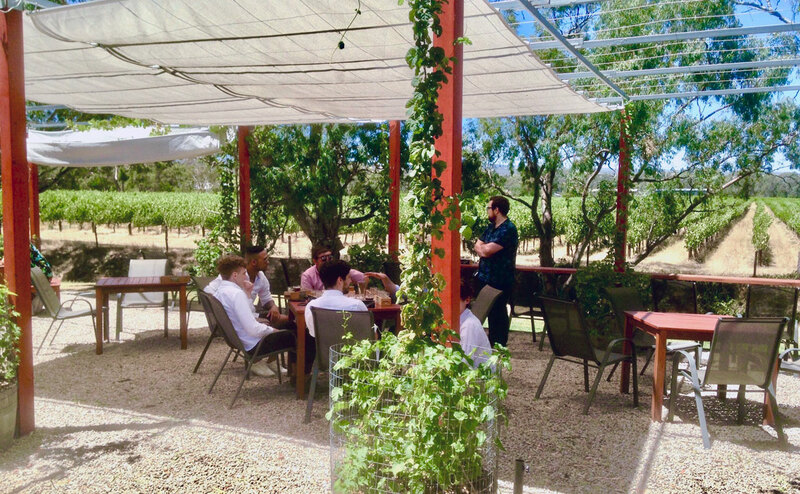 “How can a place exist that's 40 minutes from the international airport, eight minutes from the beach and have this?” he asks, gesturing to the green rows of vines outside, the sheep grazing beneath a gum tree next door and the apple and cherry orchards across the road. 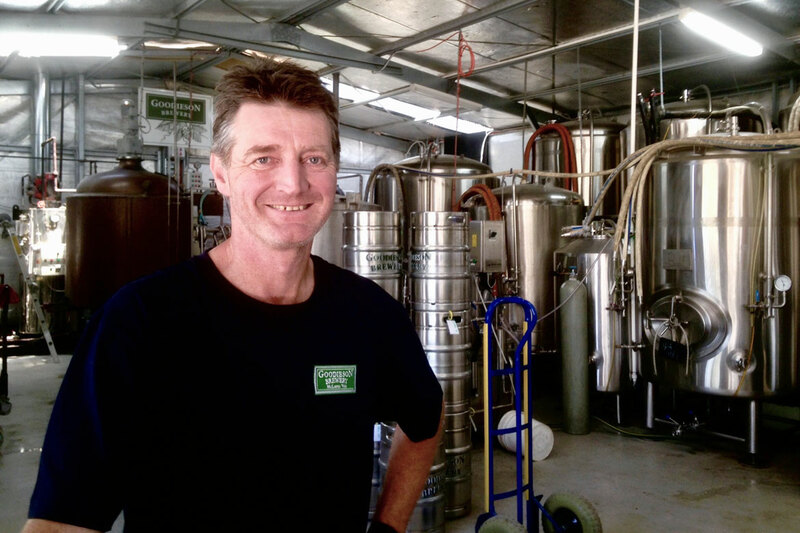 Jeff Goodieson at the McLaren Vale brewery of the same name closing in on a decade of brewing. With their house also onsite, Goodieson Brewery is very much a family business. And it's one where, rather than opening with a bang and putting what Jeff terms “marketing first, beer third”, he and wife Mary began with a modest capacity and slowly scaled up as demand dictated. For the first eight years, they used a trusty Meheen four-head bottle filler that Mary knew “inside and out” to fill every single bottle. Indeed, it was only in November 2018, after almost a decade in business, they finally poured their beer off tap for the first time. 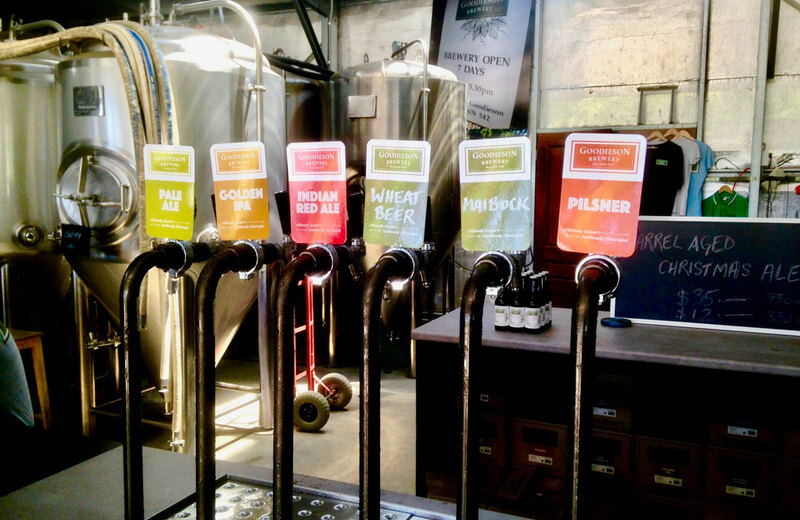 It took the best part of a decade, but now you can enjoy Goodieson beers on tap. Today, the shed that houses the brewery and taphouse is home to 11 connected fermenters with a capacity of 15,000 litres. Over the course of a year, they pump out 26 different beers. Jeff laughs when pointing out that “our mortgage is paid by four of them,” but, alongside their Pale Ale, Pilsner, Golden IPA and the rich, malty Indian Red Ale, there’s a wide range of seasonal brews. At the time of our visit, with the heavily spiced Christmas Ale done and dusted and the Maibock nearing the end of its run, he was working on a dry-hopped Autumn Ale and a series of stouts – regular, imperial, chocolate, coffee and cherry – though he notes wryly that he maintain a very traditional style of brewing at odds with some of the more experimental craft brewers who have followed SA's earlier arrivals. 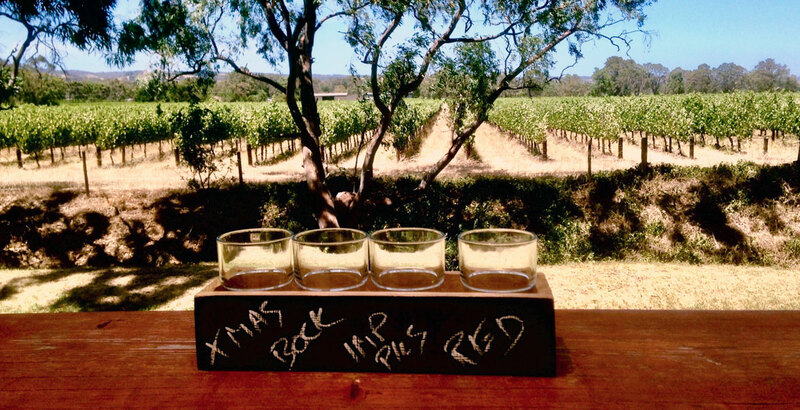 It’s why, despite being in one of Australia’s premium wine regions, he avoided barrel-aged beers for years. “How do you sterilise wood?” he asks with a laugh, looking at the barrels of cherry sour and stout next to his stainless steel tanks. The view across the Goodieson beer garden. An affinity for Teutonic beers and production methods is not surprising when you consider the pair met and lived in Salzburg for years before returning to Australia. That’s when he began a food science degree with a specialisation in malting and brewing. He studied at Federation University in Ballarat, which also happens to be Joe White Maltings’ original home. It meant that for four years he could take advantage of the micro-malting plant and small class sizes to learn everything he could about the craft. As soon as he’d handed in his honours thesis, he began working for Lion. Creating a great beer is a mix of art and science. It requires both creativity and precision and, by his own admission, Jeff leans towards the science end of the spectrum. One result of his path through the higher volume segment of the industry is an approach that “when you're doing tastings, you are trained rightly or wrongly to pick up negatives first.” Thus, his first goal is to focus on consistency and the absence of flaws. It’s an approach that might feel out of step with the contemporary craft beer scene, in which the focus of many brewers and the more excitable of drinkers is on chasing more of everything and delivering a new experience in every glass or can. Yet it's also one that's kept many a successful brewery going for many a year and one that, after almost a decade of working for himself and his family, keeps the fermenters filled and the glasses emptying in the Goodieson's bucolic pocket of Australia.